Overall, the VPL-VW90ES should be considered a marvellous projector. It's beautifully built and delivers both corking 2D and genuinely involving three-dimensional imagery. Many TV addicts are sceptical of domestic 3D. There's just not enough content available to compensate for the general inconvenience of having to wear special glasses, particularly if you like to multitask. Surfing on a laptop or snarfing custard creams are both devilishly difficult to achieve from behind Active Shutter lenses. But take 3D out of the living room and place it in a dedicated home cinema and it becomes a proposition that will make you rethink your views. 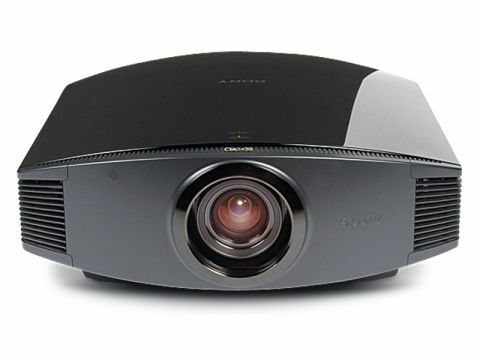 This projector is a direct descendant of the well regarded VPL-VW85 and looks very similar, but Sony's engineers have ingeniously redesigned the lens assembly to incorporate a sync transmitter for the Active Shutter spectacles. It's been designed to bounce IR codes off a screen, and such scattergun distribution should serve a family-sized audience. The only restriction is that popcorn munchers cannot sit further than 5m from the screen. If you're planning to install the device in a larger screening room, you'll probably need a supplemental 3D transmitter. The standard pack Sony sells for its upgradable 3D TVs will do the job. This standalone zapper connects via a length of RJ45 cable and should be placed at the front of the room facing the audience. It uses the same 3D eyewear as Sony Bravia TVs, although an additional filter for the lenses is required. The VW90ES is larger than you might expect, but I'd rate it as a handsome piece of kit. Irritatingly, the connection board is mounted to the left rather than at the rear (a space reserved for air vents). For professional ceiling installations this could involve a mess of cabling. However, the projector gets a thumbs up for its motorised lens protector, which effortlessly opens when the PJ is powered up and closes when switched off. Key inputs include two HDMI, one PC VGA, component and phono AV, RJ45 and a 12V trigger. The latter is used to integrate the projector with a drop-down motorised screen, while some basic hands-on controls have been located above the port panel. Helpfully, the IR remote is backlit and set-up controls are extensive; with zoom focus (a nicety missing from some of its competitors) and versatile electronic lens shift (25 per cent on the horizontal and 65 per cent vertical). Powered up, the Sony VW90ES is undeniably impressive. Fed full HD 2D fare, it's a lot brighter than its predecessor, offering silky shadow detail and seductive colours. Sony claims a dynamic contrast ratio of 150,000:1 using its Advanced Iris 3 technology, but during my session I was not particularly aware of this iris opening or closing. In action, the VW90 remains acceptably quiet, particularly if you keep the lamp set to Low. The SXRD panels can be driven to 240Hz, and this kind of refresh rate goes a long way to mitigating against image blur. The brand's proprietary Motionflow has a couple of options to play with: one creates 'intermediate' frames to smooth pans and remove cinematic judder, while another inserts a black frame to improve motion clarity. Also known as a dual black insertion technique, this Dark Frame trick makes images far crisper. The VW90ES offers an invitingly sharp static image and can maintain motion resolution pretty much up to 1080 lines. The key to keeping clarity is the Film Mode. When engaged, there's a drop in brightness, but a big jump in general detail. To maintain smoothness, Sony has added a Motion Enhancement tweak (with Low and High settings). I found the best combination to be Film Mode 1 with Motion Enhancement set at Low. Using this setting, the amount of detail extracted from Iron Man's armour during the final reel team-up with War Machine (Iron Man 2 on Blu-ray) is just phenomenal. The flaking paint is all on the screen, to the point where, even in 2D, the image looks almost 3-dimensional. With these settings locked in, the projector also aced my motion resolution tests. A scrolling resolution chart devised by the Advanced PDP laboratories kept a full 1080 lines on the plate when scrolling at 6.5ppf. Dropping luminance from 100 per cent to 50, and then 30, made scant difference to clarity. Although Sony doesn't subscribe to ISF calibration, it does offer considerable creative control. There are three cinema modes, plus Dynamic, Standard and User settings, and control over a bunch of gamma and colour parameters. The company's Real Color Processing mode allows very precise fine-tuning of skin tones and specific hues. The projector's 3D performance is equally knee-trembling. The keys to the VW90ES' 3D success can be found in the dedicated settings menu. From here you can alter both the brightness of the 3D glasses and the zone of focus within the stereoscopic image. Both are very powerful tools. For optimum 3D, the first thing you should do is minimise the brightness of the spex. By making the glasses darker, you effectively shorten the colour decay time between the left and right eye. This in turn reduces crosstalk. You'll take a hit in overall brightness (indeed the 3D experience looks a lot more like that from Panasonic's VT20 plasmas), but in a darkened cinema room environment the gain far outweighs the pain. One area where you might be tempted to increase the brightness of the glasses, though, is games. The Zombie option on Call Of Duty: Black Ops (Xbox 360) was just too gloomy to play with the glasses on Low. Sometimes you have to endure a little crosstalk if you want to survive a zombie attack. The other wizard feature is the 3D Depth Adjustment tool, which enables you to dial crosstalk off the screen. This doesn't work across the entire image, but it will eliminate double imaging at various depths. Effectively, you can remove ghosting from objects in negative parallax, zero parallax or positive parallax. Tighten background images and objects in negative parallax and credits, big closeups and effects that stick out begin to separate. Snap negative parallax into absolute focus and positive parallax images begin to drift. I never managed to eliminate all crosstalk, but I did reduce it to a benign level. Once done, the VW90ES rewarded me with probably the best 3D experience I've yet had in the home. Suddenly, all the tricks of 3D cinematic composition began to explode from the screen. When the black limo cruises up to the church at the beginning of Monsters Vs Aliens, the bumper threatens to park itself in your lap. This small detail is lost when viewed on a small 3D TV. Similarly, the opening tethered bat and ball sequence that makes you smile on a small screen, causes an involuntary flinch when projected at room size. And when Jake Scully is pulled from his cryo chamber at the start of Avatar (3D Blu-ray), the astounding depth of the spaceship is enough to cause a sharp intake of breath. For those who are bothered about the lack of available 3D content, the VW90ES also has onboard 2D-to-3D processing. This uses the same chippery as the brand's 3D Bravias and can introduce planar dimensions into any flat source. This is an unpredictable process at best, but gamers may gain some use from it.